The objective of this project was to evaluate the effectiveness and usefulness of using glued laminated (glulam) timber stringers as helper stringers to add strength and stiffness to an existing timber railroad bridge. The scope includes loading the bridge and measuring deflection of the bridge both before and after the addition of the glulam stringers to determine the percent increase in stiffness caused by the helper stringers, as well as, their effect on load sharing between individual stringers. The test bridge is located on a Pudget Sound and Pacific Railroad Co. (PSP) rail line between Centralia and Elma, Washington. This rail line serves the PSP headquarters in Elma via Centralia, and southern Washington running parallel to State Highway 12. 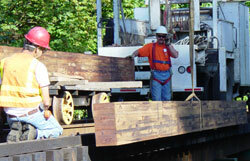 The bridge is an eight span, 114 ft. 6 in., continuous timber bridge crossing Gibson Creek at milepost 38.8. Project features include documenting the installation of the helper stringers and testing the bridge, under known loads, to determine the effectiveness of the helper stringers.